In August, I decided that I wanted to replace my primary sewing machine. It wasn’t able to do all that I wanted it to do. I was frustrated at its performance on my swim suit. I went around to several different sewing machine dealers to look at new machines. I had narrowed my selection down to three different machines Viking Opal 670, Janome 4120 QDC, and the Pfaff Ambition. Since this was a lot of money, I decide to wait until November and see if the sewing machines went on sale for the holidays. While at the sewing expo in Overland Park, I did check prices of the sewing machines on my list. Price decided which machine I would get. I didn’t want to fall in love with a machine I just couldn’t afford. In the end, the Pfaff Ambition Essential was ordered. It was hard to wait the 2 weeks for it to arrive at home (it would have been earlier except I couldn’t get out to Overland Park again until the Friday). Last weekend I took the time between baking cookies for work to play with my new machine. The Pfaff Ambition Essential was a dream to sew with. 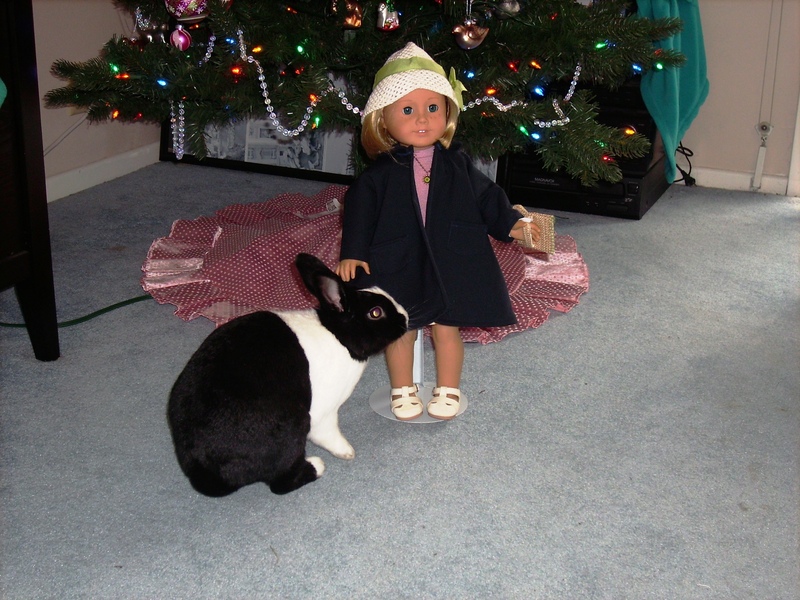 The only items I had ready to put together were doll clothing. 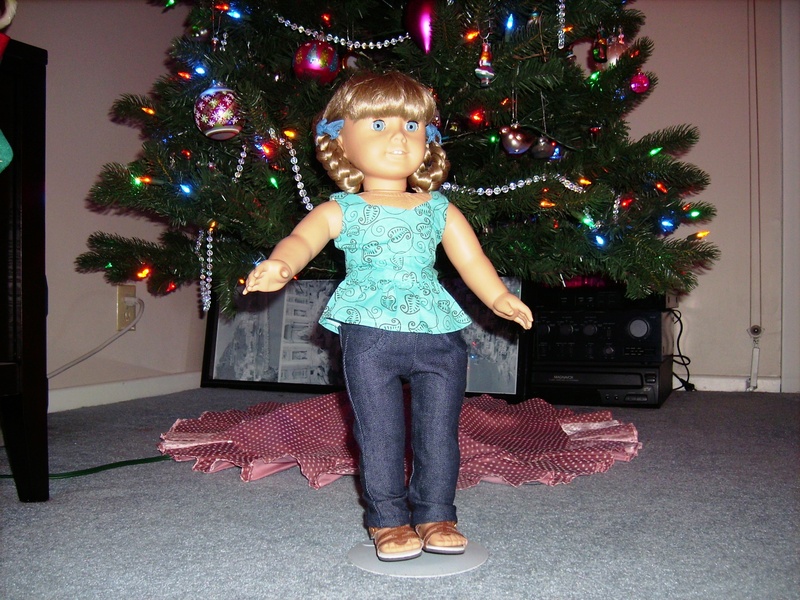 Over the weekend, I was able to get a top, leggings, a coat, and jeans completed. It handled woven fabric fine, dealt with the knit fabric for the leggings without a ballpoint needle, and didn’t even skip a stitch when it came time for the denim of the jeans. 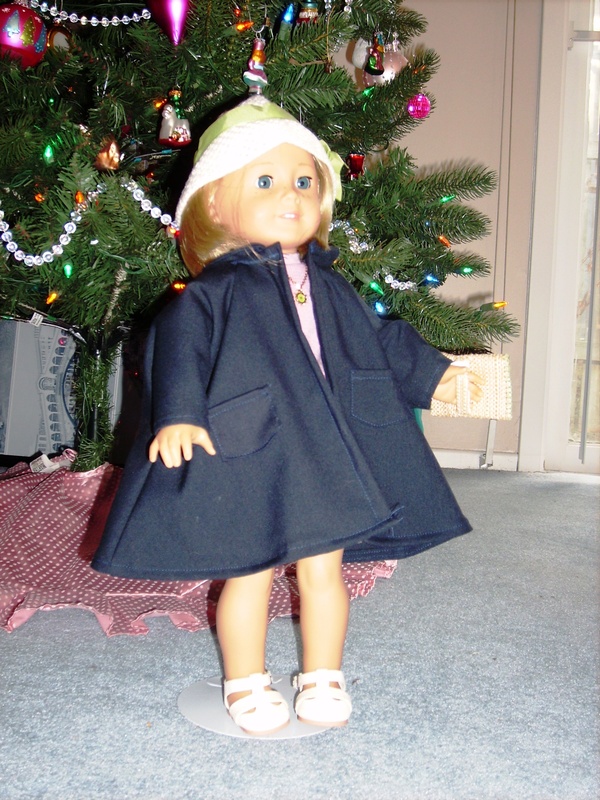 The coat is from Simplicity 4347 (1950s reprint). The only pattern pieces are pockets, collar, and coat body. The front of the coat, back of the coat, and sleeves are cut as one piece. There is no lining for the coat, but the coat body piece can be used to create one if really wanted. There are very few seams center back, and 2 side seams. There wasn’t a facing for the collar either which would have been nice to have so that could be neatly finished, but I went ahead and zigzagged the edge of the collar down to the coat. It was extremely easy to put together. It would definitely be a fun pattern for a beginner to use. I also had the blouse from this pattern cut out too, but ran out of time to get it done over the weekend. Kirsten is modeling the Liberty Jane skinny jeans and peplum top. The peplum top was pretty easy to get put together. I don’t recommend straying too far from the instructions. I was too eager to see what the top would look like that I had put together all the outside first then decided to go back to the lining. This way the armhole are very hard to finish. This is the second version of this top which I followed the instructions on (mostly except I didn’t want to put a zipper in). Turning the bodice is a little tricky especially since one is pulling the back through a narrow shoulder strap. I didn’t want to fight with the zipper. It is terrible but the top is for a doll, and I just do not always get consistently perfect looking zippers. I didn’t feel like hand sewing the zipper either. Instead I switched the fastener to a Velcro. If I want to keep with a Velcro closure, I will need to add a bit of width to the pattern. The jeans are just too cute. I noticed a major difference in the fit of the skinny jeans on my dolls. It took me about 5 minutes to put the jeans on Kirsten. I want to go back and make a version with a half-inch extra in width to see if that better fits my dolls. Otherwise, the pattern is very well draft and fits together well. I strayed a little from the instructions. The instructions have you insert the elastic in the round, but I went ahead and inserted the elastic when the jeans were flat before closing the back seam. 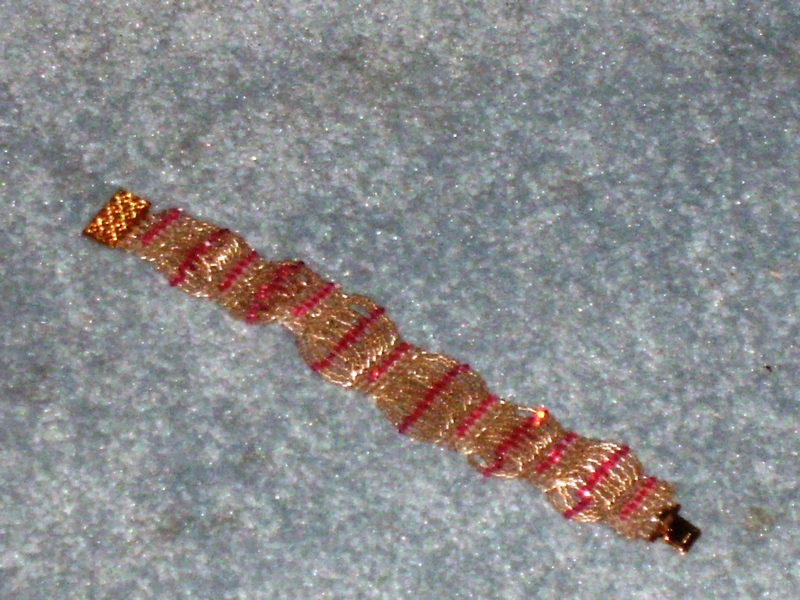 I got the Egyptian Cuff bracelet pattern from a free e-book on the Beading Daily website. But if you have the issue of Beadwork December 2008/ January 2009 magazine, it is in there also. I could easily see this bracelet being worn on Downton Abbey (granted their bracelet probably would cost more than $35). I think this bracelet has an art-deco style with the rectangles and loops. If the oval fringe loops are done in a different seed bead color than the rectangular stations, it would really highlight the art-deco feel of the bracelet. I didn’t really see this until after I got started on my bracelet. It may be something to think about if I ever make this bracelet again. Each rectangular station is created using a three layer Right Angle weave and then connected together. I picked a champagne colored delica bead and the Indian pink crystals. The stations resemble waffle fries sort of with a line of honeysuckle pink crystals down it. When you look at the completed bracelet picture in the instructions, it looks a lot denser than what the actual results are. This is a good beginner project. The pattern isn’t too hard, the directions are very clear, and there are nice diagrams. Recommended advice is to carefully watch what direction you start your second level. One cannot go complete the seven beads across the first level. The third level will not work out if the second layer is wrong. 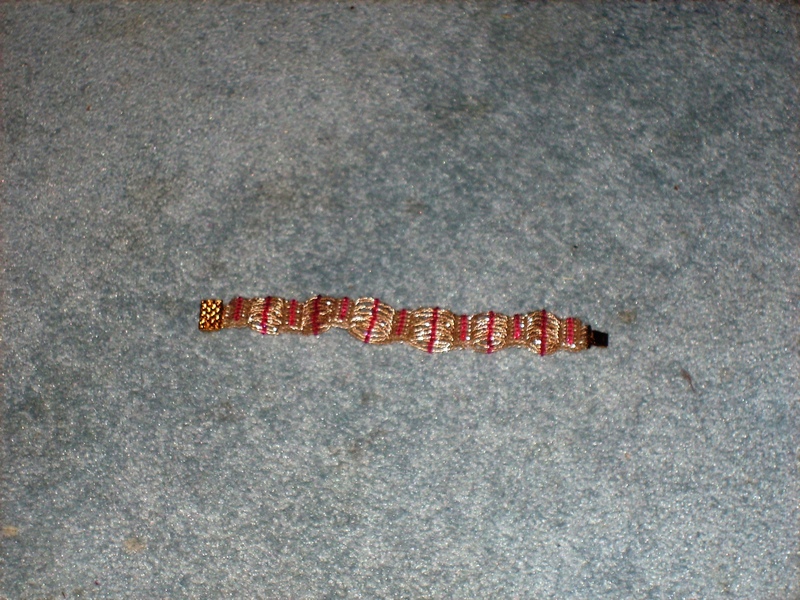 The second level has to start with the adding 3 beads across the width. This was the only thing I could come up with as to why I had to tear apart the second station I made. I could have messed up something else but I couldn’t see what else I did wrong. The hardest part of the bracelet was finding a pretty clasp. The pattern only calls for a magnetic tube clasp. But I really wanted to keep with the art deco style and thought a box clasp would look perfect on it. The box style clasp would also mimic the tile stations too. Anyways, since the delica beads are smaller than regular seed beads, I needed something with a little more length so the bracelet fit comfortable around my wrist. This pattern could easily be adapted for a necklace. The oval fringe would be longer (probably around two inches between stations) and on the short (4 stitch) side. This is the second make of this bracelet. The first one I made was too small using groups of 4 for outside loops and 7 for the center loops (7 inches total). The 7 inch bracelet didn’t give my wrist enough room to move. The second version is slightly too big and I used groups of 6 for outside and 8 in the center (approximately 7.5 inches). So probably after the new year, I will redo this again and try for 7.25 inches.